This past Monday night I had the lucky opportunity to see St. Vincent at ACL Live at Moody Theater. 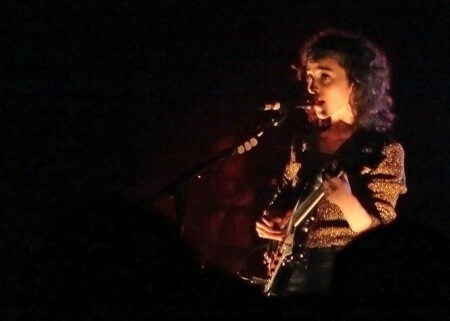 St. Vincent is singer-songwriter and Dallas native Annie Clark; she’s a talented guitarist with an ethereal voice who sings over orchestral art-rock music. I had seen her short SXSW set at Antone’s a few years ago, and I was excited to see her perform in this awesome new venue. The music was phenomenal, but she was also looking so rock chic that I was inspired to write a post about her cool look. Annie has wild, chestnut brown curly hair atop a porcelain complexion with big expressive hazel eyes. And maybe it’s because one of her most memorable songs is titled, “Your Lips are Red” (check out her ACL taping from 2009 below) that I always picture her with red lipstick. She just graced the cover of SPIN magazine’s August Style Issue, and her look Monday night proved why she deserves that recognition. To approximate the fierce look she was working at the concert, I found the following items below. I loved how she took stereotypical rock n’ roll glitter and leather and wore it in a very feminine way. And wearing shorts with tights seems oh-so-practical when shredding on the electric guitar atop a high stage in front of a thousand-plus people.